Very gradually over the past month or so, I've realized that my experience of daily common prayer has changed. While praying the canticles, the creed, and the regular prayers, and sometimes even when officiating, I am going to a place where the words just seem to be coming out of my mouth without me reading or thinking them. It doesn't seem like memory to me. I don't have to think about it. It's almost involuntary. I sense I just need to be there in church at the right time for my spirit to be in a new place, aware in the now in a new way. My availability to be in a new "zone," as it were, depends a lot on whether I am a participant or the officiant at Morning and Evening Prayer. When officiating one needs to be aware of who is in the church. When the congregation is regular and it's an ordinary day, an officiant can, for example, begin the appointed psalms at Morning Prayer on the tenth day of the month simply by beginning or with a minimal announcement, quietly saying, "Psalm 50." If there are guests, much more needs to be said. It was commissioned by a family for their home in New Orleans. The church gathered for prayer here at Saint Mary's is something that provides an important and particular witness, not only to people who have entered to pray or to those who have come in to look at the space, but also to our neighbors who cut through the church to get from one street to the other. Sometimes visitors join in our services-and it's really great when all of us become one voice, not many voices, at prayer. But we can be interrupted by many sounds: someone "resting" in the church can begin to snore loudly. (When that happens one of the priests or sisters deals gently with it.) The sirens of police cars, fire trucks, and ambulances and the horns of frustrated drivers on 47th Street can be heard on and off through most of the day. (Frustration, and the honking, have become particularly intense because of the present traffic pattern at the northeast corner of Times Square, created in order to accommodate the construction of a new thirty-nine-story hotel, due to be completed sometime in 2017.) I'm sure that a great deal of how I pray is shaped, after more than seventeen years here, by the particular physical space of our church and by how people are present with us while we worship. When I was on sabbatical during the winter of 2009, I ended up taking a small furnished apartment in Oakland, California-three BART stops from Berkeley and three stops from San Francisco. In her autobiography, Everybody's Autobiography , Gertrude Stein wrote what would become one of the more famous lines about Oakland. She had lived there as a child. When she went back as an adult, her childhood home was no more. She wrote, "...there is no there there" (page 289). If you were to ask me to describe this new place I'm experiencing when I attend Morning and Evening Prayer, I think I can say, "There is a there there"-the life of the world to come. Or perhaps I simply have a new and different awareness that, " The word is near you, on your lips and in your heart" (Romans 10:8), always near, always new. OUR PRAYERS ARE ASKED FOR Julie, Penny, Donald, Linda, Matthew, Margaret, Barbara, Jean, Sally, Cliff, Antonia, Sharon, Robert, Nicole, Robin, George, Rebecca, Joanna, Jason, Dolly, Melissa, Juliana, Heidi, Catherine, Sam, Burton, Arpene, Takeem, Toussaint, Abraham; Sidney, deacon; Horace, Hamilton, Gaylord, Harry, and Louis, priests; for all victims of war, poverty, famine, and disaster; in thanksgiving for the service of all veterans; for the members of our Armed Forces on active duty, especially Mark and Nicholas; and for the repose of the souls of Guy David Powers and Arthur Jacobson . . . GRANT THEM PEACE . . . November 13: 1893 B. Abbott Lindsey; 1913 Susan Mullins; 1929 Harry Bartlett Morrill; 1957 Alice Bosworth; 1967 Jessie W. Baker. IN THIS TRANSITORY LIFE . . . Guy David Powers died on October 29, 2016. He was a close friend of parishioner Margaret Malone. Arthur Jacobson, the grandfather of seminarian Matthew Jacobson, died on Thursday, November 10. Please keep Guy, Arthur, Margaret, Matthew, their families and friends, and all who mourn, in your prayers. STEWARDSHIP CAMPAIGN . . . We continue to make progress in this year's Campaign as pledge cards continue to arrive in the parish office. We still have a ways to go. We urge you to give Saint Mary's your support as we continue our ministry to our members, our friends from near and far, and our neighborhood. Please make a pledge for 2017 today. We hope to achieve three goals between now and November 20, Commitment Sunday: (1) to encourage all Saint Marians prayerfully to consider how they can offer their time, talent, and treasure to God here at Saint Mary's during the coming year; (2) to raise $425,000.00 during this year's pledge campaign; and (3) to have all those who made a pledge for 2016 to fulfill that pledge no later than December 31, 2016, and earlier than that if possible. To make a pledge for 2017, please fill out a pledge card and mail it to 145 West Forty-sixth Street, New York, NY 10036; or place your pledge card in the collection basket at Mass; or make a pledge online. We are extraordinarily grateful to all those who made pledges for 2016 and to those who have already made a pledge for 2017. To learn more about stewardship or the Stewardship Campaign, please speak to Father Gerth, or to a member of the Stewardship Committee (MaryJane Boland; Steven Heffner; or Marie Rosseels, chair). THIS WEEK AT SAINT MARY'S . . . November 13, 2016, The Twenty-sixth Sunday after Pentecost: Sung Matins 8:30 AM, Mass 9:00 & 10:00 AM, Adult Education 10:00 AM, Solemn Mass with Organ and Choir 11:00 AM, Solemn Evensong & Benediction 5:00 PM . . . On Sunday, November 13, at 10:00 AM in the Mission House, Father Peter Powell continues his series on the Acts of the Apostles . . . The Wednesday Night Bible Study Class will meet on November 16 at 6:30 PM in the Nursery. The class will begin reading at Romans 2:24 . . . On Wednesdays, the daily 12:10 PM Eucharist is a Sung Mass; on Thursdays the daily 12:10 PM Eucharist is a Mass with Healing Service. AROUND THE PARISH . . . Parishioner Penny Allen was admitted to New York Presbyterian Weill Cornell Medical Center for tests and treatment last Wednesday. Penny's husband, the Reverend Michael Allen, was also admitted to New York Presbyterian last weekend for treatment. He is now at home and, we hear, is feeling much improved. Parishioner Linda Bridges has moved to the Sarah Neuman campus of the Jewish Home Life Care Center, 845 Palmer Avenue, Weinberg Pavilion, Mamaroneck, NY 10543. Parishioner George Taitt is now staying at the home of his sister after receiving treatment at the Terence Cardinal Cooke Health Care Center on Fifth Avenue. He hopes to return home, and to Saint Mary's, very soon. Parishioner Robin Landis continues to recuperate at home following a cycling accident in California. He tells us that he is steadily improving. Parishioner Abraham Rochester also continues to recuperate at home and tells us that he is doing well. He also says that he hopes that he and his wife Suzanne will be back at Saint Mary's soon. He welcomes phone calls. We ask you to please keep Penny, Linda, George, Robin, Abe, and Father Allen in your prayers . . . We are very grateful to our lay delegates, who attended diocesan convention last weekend. They all represented Saint Mary's very effectively. There is more information about the convention-election results, resolutions, changes to the canons, bishops' addresses, and recipients of the Bishop's Cross-on the diocesan website . . . Altar Flowers are needed for the following Sundays: January 1 and January 15. We also hope to receive donations for the reception in Saint Joseph's Hall on December 8, The Feast of the Conception of the Blessed Virgin Mary, our patronal feast. If you would like to make a donation, please contact the parish office at 212-869-5830 x 10 or by e-mail . . . Attendance: Last Sunday 329. MUSIC NOTES . . . The setting of the Mass on Sunday morning is the Mass for Four Voices by Thomas Tallis (1505-1585). Tallis was one of the most foundational composers of English church music. His long life and musical career included service under four English monarchs-Henry VIII, Edward VI, Mary Tudor, and Elizabeth I-with all the shifts in the church's liturgical and institutional life that these different reigns occasioned. Tallis's early life is not well documented, but references to his musical employment begin to appear as early as 1532 when he was appointed organist at the Benedictine Priory of Dover. Notably, he was later employed at Canterbury Cathedral and served as a Gentleman of the Chapel Royal. Along with William Byrd, Tallis enjoyed an exclusive license to print and publish music that was granted by Elizabeth I in 1575. While he was one of the first musicians to compose for the new Anglican rites of the mid-sixteenth century, Tallis retained an affection for the Latin forms and continued to compose extensively for them. Tallis's unnamed Latin Mass for four voices probably dates from the 1550s. Its musical style reflects the trend of that time away from very florid liturgical settings and toward syllabic and chordal compositions, favoring clearer declamation of the text. The motet sung during the administration of Communion on Sunday is a setting of "Love (III)" from George Herbert's 1633 collection The Temple: Sacred Poems. 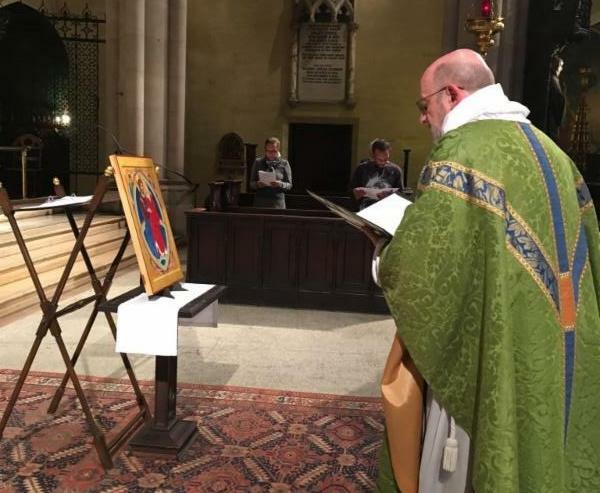 This musical setting by David Hurd is for unaccompanied choir and was composed in 1991 for the fortieth anniversary of ordination to the priesthood of the Reverend Charles W. Scott, who was then an associate priest at All Saints Church, Manhattan. The music is reflective of the syllabic and chordal style that Thomas Tallis and other early Anglican composers were encouraged to adopt to enhance clarity and maximize the intelligibility of the words. At the same time, the six-voice texture and harmonic vocabulary of this setting give Herbert's seventeenth-century poem a twentieth-century expression. New York City Marathoners walk by the church on Sunday, November 6. LOOKING AHEAD . . . Sunday, November 20, The Last Sunday after Pentecost and Commitment Sunday. Parishioners are invited to place their pledge cards in the collection baskets during the Offertory . . . Wednesday, November 23, The Eve of Thanksgiving Day, Sung Mass 6:00 PM . . . Thursday, November 24, Thanksgiving Day, Noonday Prayer 12:00 PM, Mass 12:10 PM . . . Wednesday, November 30, Saint Andrew the Apostle, Sung Mass 12:10 PM, Mass 6:00 PM . . . Friday, December 2, 8:00 PM, New York City Master Chorale, "Majesty and Light." Music by Rutter and Lauridsen. Featuring the Manhattan School of Music Chamber Orchestra. Tickets may be purchased online . . . Saturday, December 3, 2016, 8:00 PM, New York Repertory Orchestra. Annual Benefit Concert. Tickets $10.00. Music by Pärt (Trisagion) and Beethoven (Symphony No. 9). Saint Mary's parishioners Grace Bruni, cello, and Mark Risinger, baritone, will perform at this concert.